But maybe we should hold on a second. Norton Antivirus wins a lot of awards etc but then it would. It is manufactured by Symantec and they are definitely a leader in corporate antivirus technology and a good supplier to deal with on that level but they will charge you for any support as a home user and charge you to update your signature files after your trial period. A better option is to lose the installed antivirus and get AVG Free Edition from Grisoft which picks up as many viruses as any other home edition antivirus package. Grisoft's solution is available from http://free.grisoft.com/doc/1 and I would urge you to pay for the full edition if you are a business as the extra functionality is worth it. Avast Antivir are also perfectly good examples and are also free. Whatever you do, make sure you have a suitable solution before just surfing unknown pages. ALSO: Keep Windows Updated! Many Windows updates are to close holes exploited by malicious programs and simply staying updated will keep a lot of infections off your system. What antispyware system should I use? Well first of all, a lot of decent antivirus solutions get spy-ware as well as ad-ware and viruses as they are all basically the same thing. They are all darn annoying and the primary reason new internet users run into trouble. Most of the anti-spy-ware solutions these days use all of the spy-ware and virus hassles to try and sell themselves - I have people calling me asking how to get spy-axe and spy-ware-killer OFF of their machines. These are not solutions being sold to enrich computer use, they are immature, trip-you-up pieces of software designed for a quick buck and some new users will be caught out. In my experience there is no anti-spy-ware solution - even the ones from Microsoft and the like - that catch most of the ad-ware and irritations that can be removed simply by going into Control Panel in Windows and removing everything you do not use or recognise. If you are determined to use other means or have tried all of the above you can also run these on-line scans. PandaActivescan Housecall Scan although they require an Active X download which your Firewall may object to. It is important that your computer is run at minimum functionality. Windows is like a pen-knife - it can do almost anything you need it to - but if you are not hosting a website then make sure that the Web-Hosting features are uninstalled. You can do this in Control Panel under add/remove programs and then by clicking add/remove windows components on the left (Windows XP - the others are similar.) Every bit of unnecessary functionality can be used against you so try and run a tight ship. Make sure you have a reason to keep everything you see in this screen. If you don't use network printing then get rid of it. If you don't use Fax services then get rid of them. Every one you can dump frees memory and so decreases the work your computer is doing to swap out the page-file which equals more speed. Once you have spy-ware/ad-ware or a virus infesting your system it will be taking you to an undesirable website or you will be getting pop-ups of some kind or whatever. Do not go running to the first advert you see. Your friends are the other people who have had the problem. Do a search on the Internet for a description of the symptoms and have a read of some articles that do not get money off of you for your custom. Forums and the like. There will be instructions. If you cannot get to a website other than the one to which you are unwittingly directed, go into control panel and add/remove programs, and get rid of anything with an incomplete name (I mean uninstall it by get rid of) or anything that you do not knowingly use. If you are unsure, then have a look in the documentation for the software name in question. Do not just uninstall everything you do not recognise, check the system again at each uninstall to see if the problem is cured so you know for sure which application was causing the problem. 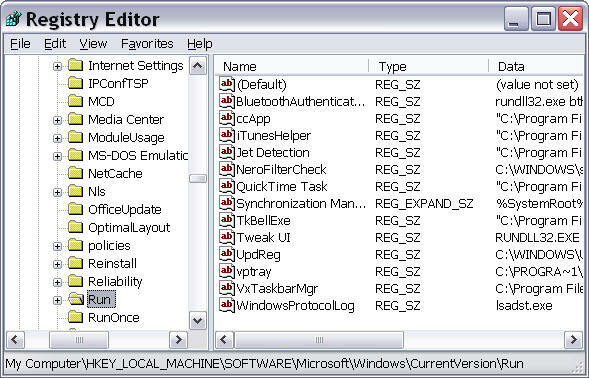 Many of the processes aggravating you or your computer are to be found here or other similar places in the Windows Registry. Note that in a lot of articles it is common to substitute HKLM for HKey_Local_Machine and that there are as many trouble causers as do-gooders so try and find a good source of information and verify it. Once you have found a source to be good more than a few times you can start to trust the information you find there. With issues like SpyAxe where the product repeats that you have a virus, remember a few things. If the product it is asking you to install is not already installed then how can the computer know it has a virus? SpyAxe is a pain in the backside for computer users and support personnel alike and to remove it you can use the free tool from noahdfear.geekstogo.com/click%20counter/click.php?id=1 which has instructions enclosed. Please feel free to submit any other spy-ware problems at http://ReadAllAboutIT.org.uk for us to have a look at. If you wish to try an anti-spy-ware application to help clear up your PC, have a look at the anti-spy-ware review site for a decent opinion of which one works best as we prefer companies to be inspired to make a good product rather than just hard-selling via cheap viruses and ad-ware; if they keep trying to hard-sell you things, tell us, and we will find a better link. In the modern business, the choice to host your own email or move in to the cloud is pretty much a 'no-brainer.' Email Hosting UK servers allow for all of the services that your in-house Exchange Server provides. Call on +44 844 880 1618 to discuss your migration. Our consultancy service is designed for SMEs who would like some help to get moving toward a streamlined & reliable computer system.